Frontier Gentleman began with these words: "Herewith, an Englishman's account of life and death in the West. As a reporter for The London Times, he writes his colorful and unusual accounts. But as a man with a gun, he lives and becomes a part of the violent years in the new territories. Now, starring John Dehner, this is the story of J. 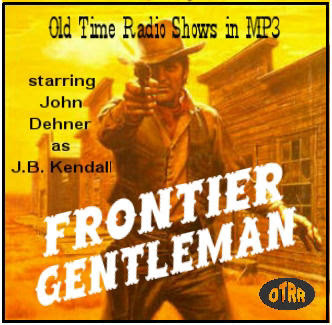 B. Kendall, Frontier Gentleman..."
That was the beginning of as fine a series of Western drama as ever graced the air. Frontier Gentleman was the last important show to premiere on radio. It was heard on CBS for a brief run premiering February 9, 1958, and stands as the only serious rival to Gunsmoke in the Radio Hall of Fame. The producers could do no better with the part of Kendall than John Dehner. Dehner, who also played Paladin in the better known but inferior Have Gun Will Travel, was always convincing in these parts that called for dry wit and subdued sophistication. His handling of J. B. Kendall was letter-perfect, and he got fine support from such old pros as, John McIntire, Jeanette Nolan, Lawrence Dobkin, Stacy Harris, Harry Bartell, Virginia Gregg, Jack Moyles, Joe Kearns, and Jack Kruschen. The series was created by Antony Ellis, the writer-director whose work on Gunsmoke, Escape, and other top shows stamped him as one of radio's outstanding talents. Wilbur Hatch and Jerry Goldsmith, both composers and conductors, were responsible for the beautiful trumpet theme that introduced the show. Kendall's adventures through the new territories came in all forms. There was tragedy, brutality, pathos, and earthy humor. Kendall met nameless drifters, bushwhackers, and real people from history. Ellis asked his listeners to believe that when Jack McCall shot Wild Bill Hickok during a poker game, J. B. Kendall was one of the players. Kendall met Calamity Jane, Jesse James, and "the richest man in the West". He won a slave girl, Gentle Virtue, in a card game, and became friends with a gambling queen. He defended an unpopular man against a murder charge, and one night on the wild Kansas prairie, he even had a brush with the supernatural.